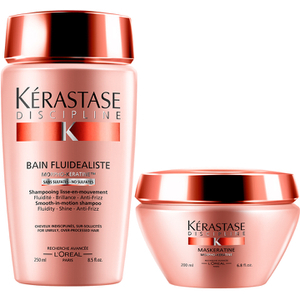 Say goodbye to dry, brittle hair with Kérastase Discipline Maskeratine. This intense conditioning treatment's creamy formula contains keratin, proteins and lipids that protect hair from heat, sun, and other elements that can damage over time. These concentrated ingredients bring moisture to each strand, preventing split ends and breakage. Hair that is chemically treated, thick or unruly can be soft, manageable and easy to style with just one use. Just wash and towel dry hair as normal, add a small amount to wet hair, and leave on for about five minutes before rinsing thoroughly. No heat needed! For optimum results, use after every shampoo. 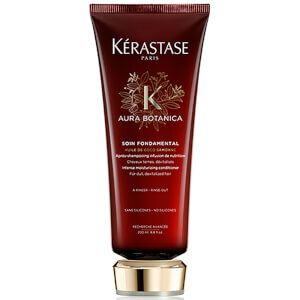 Great product, i use it 2 times a week makes your hair silky and managable. I am amazed how soft and straight my hair gets. With just on application I saw the difference on my hair. I am using this once a week. Totally approved. I have very straight but 'frizzy' hair that has been subject to a fair bit of colour over the years! This product really helps smooth the cuticles and cut down the frizz! I couldn't live without it - I recommended it to a friend who has had the same experience. My hair is coloured many times and bleached, it is very damaged.. I used this mask and from the first time I noticed a difference.. my hair is soft and shinny and the smell is beautiful.. how I use it? after I come out of the shower I put it on and put a plastic cap and leave it for half an hour and then wash my hair at the sink..
My hair is blond and dry, frizzy; treated but not damaged. After using discipline maskeratine hair is shiny and not frizzy at all. Also hair volume is nice. Smell is absolutely perfect (would like to buy perfume with same smell :-)) Note: for maximum effect leave it on hair for some 10 minutes and do some styling with brush and blow dry (pure hair drying is not giving maximum effect). Like it a lot and would buy again. Love this stuff. Usually use the masquintense but thought I'd give this a try and it's even better. Hair is super smooth but the real plus is that it smells divine, I don't really love the smell of masquintense. This stays smelling nice till the next wash and keeps my unruly hair more under control.